Modern language courses usually include a speaking final. That final can take many forms such as a teacher asks a student a question, students work in pairs on a topic, etc. Even more varied is how the speaking final is assessed such as a holistic score, an analytic rubric with numerous components, or a checklist. The more important question is “What is the speaking being assessed against?” Does the teacher judge the students based on the teacher’s concept of he or she individually think good speaking is? Are there state or national standards or proficiencies that the students are being assessed against? Without a definite standard or proficiency, the speaking assessment measures very little. 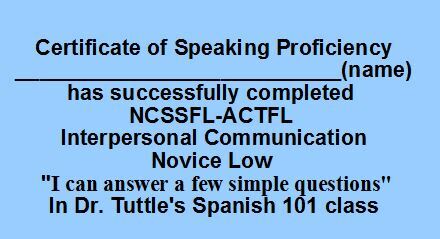 One reliable technique is for the teacher to ask each question based on the NCSSFL-ACTFL Interpersonal Communication Can-Do statements. The teacher asks one or two questions for each section of the Can-Do at the Novice and the Mid level.. For example, a teacher asks for Novice Low “I can answer a few questions”- “Do you prefer water or soda? and “When is your Spanish class?”.The teacher bases . The teacher structures the questions going from the lowest level of Novice Low to the highest level of Novice Mid (assuming the class reached that level). The teacher uses these national proficiencies to measure at what level of the proficiencies the students are. The teacher has a reliable and valid speaking final. The students’ score on the speaking final represents the highest level of their speaking proficiency based on national proficiencies. What does your speaking final measure? At http://bit.ly/tpthtuttle, I have 30+ ready-to-use Spanish speaking activities and numerous Spanish culture activities. In addition to teaching college Spanish, I also teach a college English course, Writing Essays Through Literature. My literature is all Hispanic-translated literature. My English students are native USA citizens. They have lived in an English-speaking environment all their lives. They have gone through twelve years of school in which all their classes were conducted in English. They have had twelve years of English classes. My students are at least 18 years old. However, they still make many English grammar mistakes in their writing such as subject -verb agreement, sentences without verbs, incorrect past tense forms, pronoun errors, etc. Based on my English teaching experience with native English speakers and their mistakes in their native language, I realize that we modern language teachers cannot expect our students in the modern language to be grammatically perfect no matter what their level. Even four years of a language course is not equivalent to eighteen years in the native language!